Eggs are good for kids, teenagers or adult, no matter what age you are. It is delicious and a good source of choline, protein, vitamins B, vitamin A and vitamin D. Here are 3 easy ways of cooking eggs. 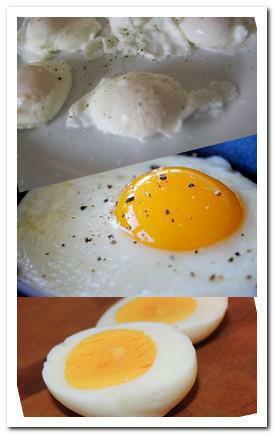 Enjoy delicious eggs with very little time and efforts. Place eggs in a pot. Add cold water that enough to cover the eggs. Cover the pot and turn up the heat, bring the water to a boil. Turn off the heat and keep the pot covered. Let the eggs sit in the hot water for 20 minutes. Transfer the eggs into cold water. Rinse the eggs with cold water for a few times until the eggs are cool enough to handle. Peel, cut, season with salt and pepper and serve. Heat cooking oil in a non-stick skillet at medium heat. If using butter, melt the butter. Crack the egg and gently slip into the skillet. Cook until the egg whites solid. Use a spatula, flip the egg over and cook for a few seconds. Remove the egg from the skillet. Season with salt and pepper, soy sauce or dark soy sauce, and serve. In a saucepan, fill with a few inches of water, bring to a boil and turn the heat down to very low simmer. Crack an egg into a small bowl. Slide the egg into the simmering water, try to keep the bowl close to the surface of water when sliding the egg. Cook until the egg white is firm and solid, around 3 minutes, remove the egg from the water. If you are cooking more than one egg, do it one by one. Seasoning with salt and pepper and serve.